Alive After Five- January- Baby it’s cold outside! Happy New Year! Start the new year off with a tried and true favorite Alive After Five! We all know our shop keepers are pretty good cooks. Well, this month they pull out all the stops! Bragging rights and a little bit of cash are up for grabs! Walk around, taste the food, be a part of historic downtown’s shopping and entertainment scene! With 10-15 shops you will surely find a Chili or Soup to name best of downtown! So many great shops this month! CJ Gift Co, dorMail Gallery, Reunions Antiques, Americana Furniture and Antiques, CBD Katie, Carriage Work Laundry, Shaman Botanicals, Kansas Embroidery Co, The EuroPottery Shop, the Natural Well, Dad’s Toys and Trains and Bling Equals Dreams! Buy your tickets now and pick up on January 3, at Kansas Embroidery Co, 305 Cherokee or dorMail Gallery, 117 Delaware. Or buy your tickets from the Leavenworth Main Street Office, 416 Cherokee. 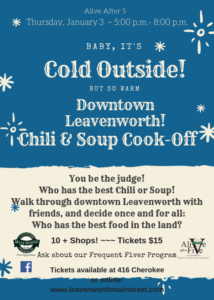 Leavenworth Main Street Program, Inc.